Canada’s Mountain National Parks are home to some of the world’s most spectacular slopes and peaks to explore on skis. 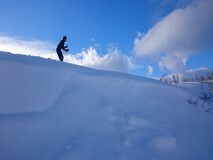 The backcountry ski in Banff National Park is near endless. There are so many options for single day and multi day tours covering all sorts of terrain. The CADETCANSKI expedition is a 9-day course. This course is an introduction to alpine ski touring (a minimum of 40% of course time will be spent in off-piste terrain). The content will include ski touring clothing and equipment, winter hazards, planning and participating in a tour, avalanche awareness and avoidance, movement of skis in ascent and descent, navigation on skis, route choice and finding. The outcome of CADETCANSKI is for the candidate to achieve the SF2 award by demonstrating a basic level of skill in alpine ski touring skills to be a competent member of a led group on basic ski touring expeditions.